And the winners of the Feedburner T-Shirts are..
And the winners of the Feedburner T-Shirts (as chosen by our completely automated selection process) are …. at the bottom of this post. In another shock scandal, Bernie Goldbach got disqualified by following a link from his own blog. He did send the most (25) commenters our way, and since we’re making this up as we go along, if anybody doesn’t take up their prize , I’ll pass one onto him. Thanks to everybody who took part , and to everybody who posted the message on their blogs! (Bernie , Damian, Phil, Billy Leo and Podcasting Ireland. Drum Roll please …. The winners are …. Jonathan Brazil (from the Weblog of the same name) , as sent by Irish Eyes. Bernard from Running with Bulls, as sent by Irish Eyes. What happens next? I have the winners emails , so I will contact them directly to arrange posting the stuff out. Read this first to understand what is going on. Leave a Comment with (1) your name , (2) email (will be hidden) and (3) the blog that sent you here. Only comments that include all three items are in with a chance of winning. Winner will be drawn from the people who leave comments on Tuesday 27th Feb. In a shock turn to the Irish Blog awards, Damien Mulley has been revealed (allegedly) to be in receipt of a pint for his efforts in the ‘increase your subscribers on feedburner‘ award. Anonymous sources detailled his use of the Irish Blog Award feed (which increased it’s readers 32 times) to win this prestigious award, which is the premier alcohol based award in the Irish Blogosphere. We didn’t bother asking Damien for a quote about these allegations, prefering instead just to make it all up buy him the pint. In the interests of fairness, Runners up Richard Hearne (offering free Search Engine Optimisation) and Eoghan McCabe (offering 2000 Euro worth of his time) were also not asked to comment. Organiser of the competition , Paul Browne, is understood to be lining up a round 3 to give away goodies donated by Feedburner themselves, once the libel action with Damien is settled. Final Results for Round 2 of this challenge are now here. In a recent challenge , Ken McGuire crushed all opposition by reaching 100 subscribers on Feedburner before anybody else could roll out a shameless self publicity campaign. So , to give everybody a chance, we’re going for another round. You can join in at any point (leave a comment below to get included). 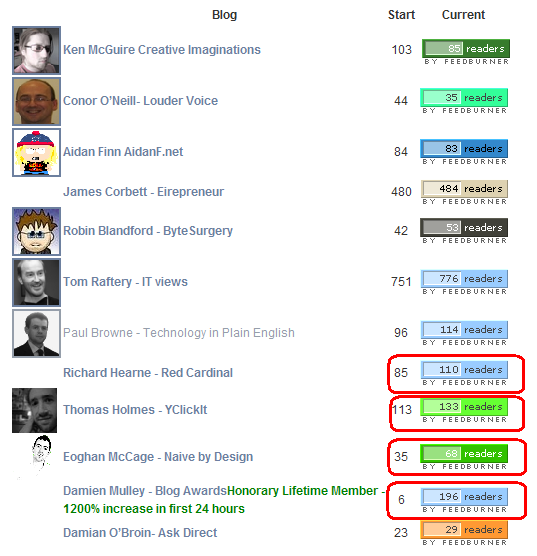 The rules are simple : The person who gets the biggest % increase in FeedBurner subscribers (that’s the number on the top right of the blog) between now and the Irish Blog Awards wins. Prize is a pint. And yes, all is fair in Love, War and trying to up your Blog numbers. To subscribe to this blog (we really can’t afford to lose twice in a row, the price of drink in Dublin being so high), click on the Orange XML icon on the top right of this page. If you’re not automatically asked to subscribe , you may want to sign up to a service such as Bloglines. Subscribing means that you’ll automatically be updated on who is in the lead. Due to popular demand (and the fact Damien will have 17 Squintillion subscribers before next Tuesday) we’ll probably have a round 3 after this one. If you want in , leave a comment. Remember, it’s all about the percent increase, so it’s an advantage to start small. Older News1):The most Recent entrant is Richard Hearne of Red Cardinal. With the SEO Ninja tricks this man has up his sleeve, he’s going to be a fairly strong contender.2): Mon Dieu! Thomas Holmes has entered. Almost certain to use a 2 language blogging strategy to take the title, how will the other competitors react?3): Eoghan is in. Damien and Damian may be in. Are there going to be any other last minute entries? 5) In another shock first day wipeout: Damien Mulley has increased his total by 1200% using a little known site called the Irish Blog Awards. I’ll check the small change down the back of the sofa , buy Damien the pint, and the rest of us mere mortals can continue on to see who gets pint number 3.